The medal collection and memorial plaque on the left were awarded to Leonard and are still owned and treasured by the family. In addition the family have a large collection of photographs and memorabilia. 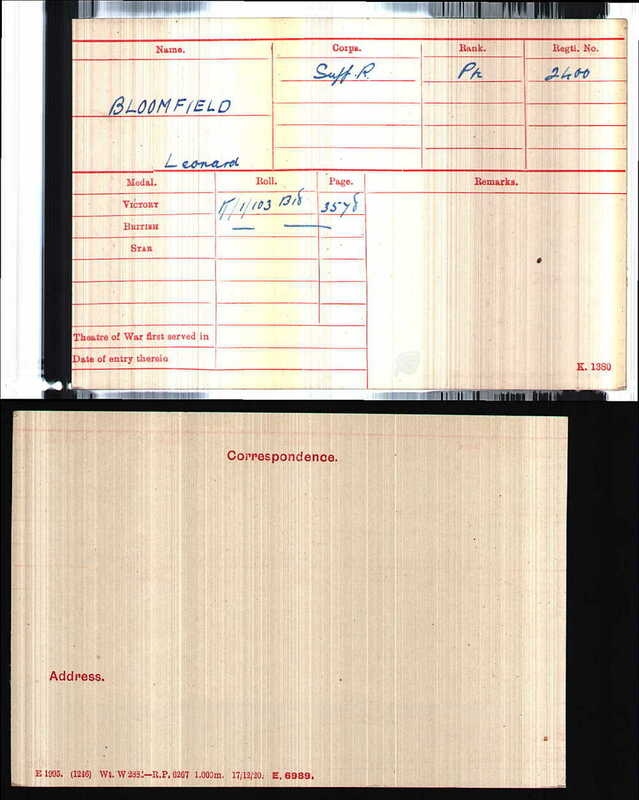 Private Leonard Bloomfield was one of six brothers who served King and Country during the Great War years. Leonard was sadly killed, but his brothers all survived and their stories are told under the survivors link. Leonard was born in Hadleigh in 1895. 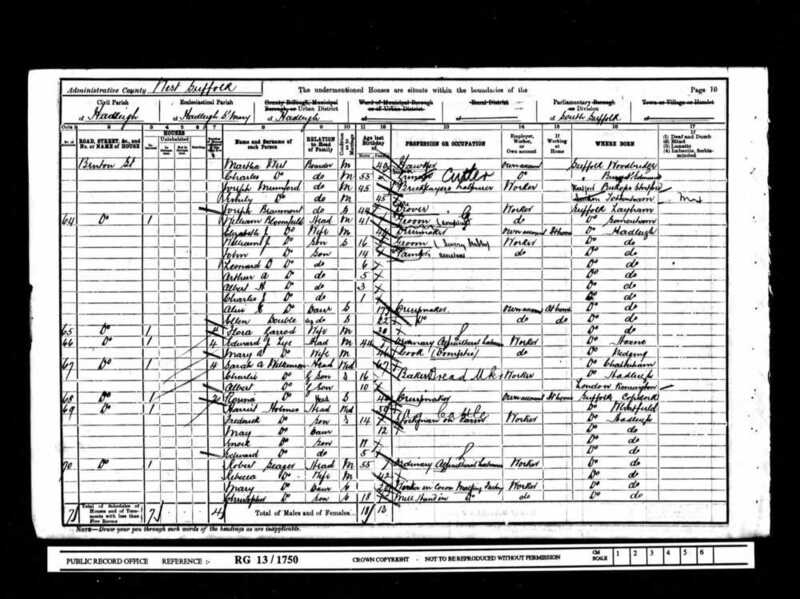 The 1911 Census report him living at home with his parents and siblings at 113 Benton Street, Hadleigh. We are not sure exactly when he enlisted, but it seems like many other young men from Hadleigh, Leonard joined the local territorial battalion, the 5th Suffolk Regiment. If we assume that Leonard had joined the battalion before war broke out then we know that he would have been mobilised on the night of the 4th/5th August 1914. The battalion then spent a number of months carrying out home service tasks. At that time territorial units were liable for home service only and were not required to deploy overseas. However, when it became apparent that more troops would be needed for overseas service, the men of the battalion were asked to volunteer. After giving this some serious thought, 72% of the men volunteered and the battalion was redesigned 1st/5th Suffolk Regiment. Those who opted to stay on home service duties only, became the 2nd/5th. Leonard had 5 other brother's who all served King and Country during the great war years. They all survived the war and decided that the first of them to have a son, would name him after Leonard in tribute. Leonard's youngest brother Charles went on to have the first son and Leonard (Junior) grew up knowing that he had a connection to the uncle that he never met. 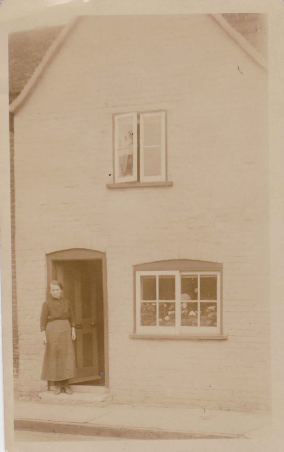 The Bloomfield family later moved away from Hadleigh, but still live local to Ipswich. When the young Leonard became a grandfather, he told his grandchildren all about his uncle and the group paid a visit to the original family home at 113 Benton Street. 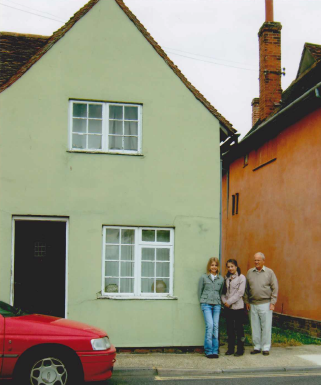 Leonard Bloomfield (Private Leonard's nephew) with his grandchildren visiting the family home. We hope that this page has been able to tell the story of Leonard Bloomfield. If you know of any information which might help to add to the story then please get in touch.